Plant closures like Honda’s in Swindon raise the spectre of decline for Britain’s auto sector. Yet the underperforming site always looked vulnerable. The bigger test is whether global carmakers want to build electric vehicles in the UK. Brexit will prove a huge deterrent. Hellman & Friedman and Blackstone are buying classifieds group Scout24. They can’t pile much debt on it, and the return looks way off the level investors usually expect. With buckets of cash, private equity needs to do deals. Buying fast-growing targets offer a little security. The $820 bln retailer may take a stake in electric-truck maker Rivian. That’d be its third mobility play this year. It’s unlikely Amazon aims to build cars. Instead, along with its robotics and cloud efforts, such investments should allow it to tackle mounting logistics concerns. The $33 bln Japanese carmaker cut its operating profit forecast in the first results posted since ousting Chairman Carlos Ghosn. Declining profitability underscores the importance of deeper cost-sharing with partner Renault. But alliance tensions suggest pessimism is warranted. 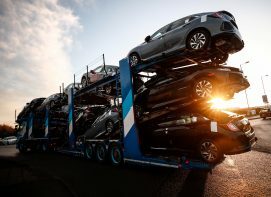 Talks with Europe and Japan are not going well, increasing the odds of the White House taxing their vehicle imports. The possible $42 bln sales hit and 200,000 lost jobs would hurt voters in a way Trump’s overall tariff tirade hasn’t. That may finally prompt lawmakers to wake up. Shareholders wiped 10 pct off the Italo-American carmaker’s value after it forecast a weak 2019. Europe, in particular, is a concern. But It’s not the only carmaker struggling in the region. That should give CEO Mike Manley a chance to strike a partnership, the sooner the better. The Japanese carmaker’s U-turn on building sports utility vehicles in northeast England owes more to falling demand for diesel engines than Britain’s impending EU exit. Still, a no-deal Brexit would make it nearly impossible for Nissan to justify current levels of UK production. A stronger yen docked some $390 mln from Honda's revenue last quarter, adding to other blows. It's been tough to juggle a safe-haven domestic currency and growth that comes largely from overseas. Rival Mitsubishi's stellar results, built on emerging markets, show it can be done. The ride-hailing app plans to occupy a newly designed $135 mln building, under an 11-year lease. From Myspace to Yahoo, lavish moves have been a bad omen. Grab has cash, but is young, unprofitable and in a fierce rivalry with Go-Jek. Tech optimism may have gone too far again. Louis Camilleri sent the carmaker’s shares up 12 percent by pledging to hit a 2020 target in 2019. Investors spooked by his cautious driving when he took over last summer will be cheered. But the more the outlook chops and changes, the more investors will discount its durability. CEO Elon Musk presided over a second profitable quarter. But U.S. Model 3 demand may be tapering off, competition and customer gripes abound, and there’s little cash for investment. Musk needs electrifying sales in Europe and China to prove the $53 bln Tesla’s staying power. Renault has well-qualified successors lined up to replace its former CEO and chair, who resigned. They have the French state’s implicit backing. The political association could, however, raise hackles at its Japanese partner, making it harder to resolve the crisis in the alliance. The two Japanese companies are uniting to power electric vehicles. It should provide a technological step forward for the $200 bln automaker, but also reduce Panasonic’s dependence on Elon Musk’s Tesla. Toyota’s control, though, may yet limit plans to sell to other manufacturers. The CEO’s ho-hum VW alliance made the carmaker the talk of a sluggish Detroit auto show. But Ford also disclosed that trucks and vans generate 135 pct of earnings. That highlights the need for speedier fixes to other, sputtering units – or a full merger that Hackett rejects. Governance changes on the Japanese side may reduce its French partner’s board power. Yet Renault’s 43 pct stake is its trump card, and Nissan’s moves to skirt it are likely to fail. It’ll take time, but Paris should one day get what it wants: closer integration and maybe a deal. The electric-car maker’s CEO effectively issued the firm’s first profit warning, saying it needs “luck” to turn a “tiny” profit this quarter and cutting staff. If this is the start of a more pragmatic approach by the firm after years of Musk overpromising, that’s no bad thing.